And that history seems a charmed one. While Cammie Coker was still in school she went to work for the Boggs brothers at Midwest during her summers. She soon developed a talent for conditioning Arabian horses and was even entrusted with the care of the legendary Padron's Psyche during a Scottsdale show, owned at the time by Four Star Arabians. 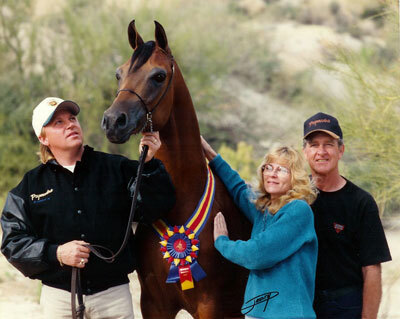 Because of their growing interest in Arabian horses the family ventured to Scottsdale and bought a breeding to Padrons Psyche and set out to find the perfect mare to breed to him. They found it in the beautiful bay Aladdinn daughter, Tomorrow's Dream. After leasing the mare from Ken and Donna Topp they bred her to Psyche. 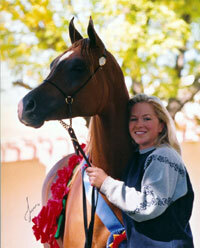 When the foal was born at Four Star Arabians the Cokers' breeding decision was well validated. They were flooded with offers on the impressive colt. After Cammie spent time with him she knew he was special and urged her parents not to sell him. So off to Scottsdale he went for the first time at about 6 months of age. After a couple of very successful years there, the colt, Psymadre was named Three Year Old grand champion with David Boggs. Very soon after this Ventura Farms came calling. He's now establishing a dynasty of his own for them. On their second breeding to Padrons Psyche they again were rewarded with a beautiful colt, Psytanium. 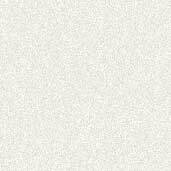 In spite of many offers they made the important decision to keep Psytanium. The decision was a good one. He has garnered many honors for the Cokers including 1999 US Nationals champion yearling colt and two year old Scottsdale champion colt (unanimous). In a nail-biting three way tie for first at Canadian Nationals the colt finally placed third when the call was placed by a single judge. He was also third place in the three year old US Nationals futurity colt class, Unanimous champion with Bob Boggs at Scottsdale as a 5 year old, and third place at US Nationals in 2004. Psytanium has always carried his weight in whatever task he's been given, in spite of the fact that Rock Ridge Arabians is a relatively small, family-run operation. The superstar colt has now been retired from showing to relax and make his greatest contribution yet: that as breeding stallion. And he hasn't disappointed. 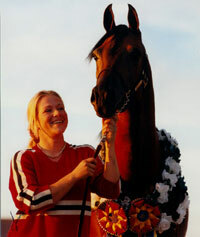 Psytanium has made the Arabian Horse Times' Top Junior Sire list for three years running, in 2004, 2005, and 2006. He is also on the Top Ten list of sires of regional winners. And his babies are no different that their talented sire. His son, Tytanium, as a three year old was judged third in his class and Reserve Champion in Signature Colts at Scottsdale. And his daughters are becoming impressive broodmares. When asked about his favorite part of breeding Arabians, Mr. Coker immediately knows. "It's the babies. I love the babies," he says. He knows that producing beautiful and functional babies is really important to a breeder. "We're always looking to get better and better babies with our breeding decisions," he confirms. And from the looks of list of the world class clients that are also producing beautiful babies, Psytanium is helping to make this goal a reality.